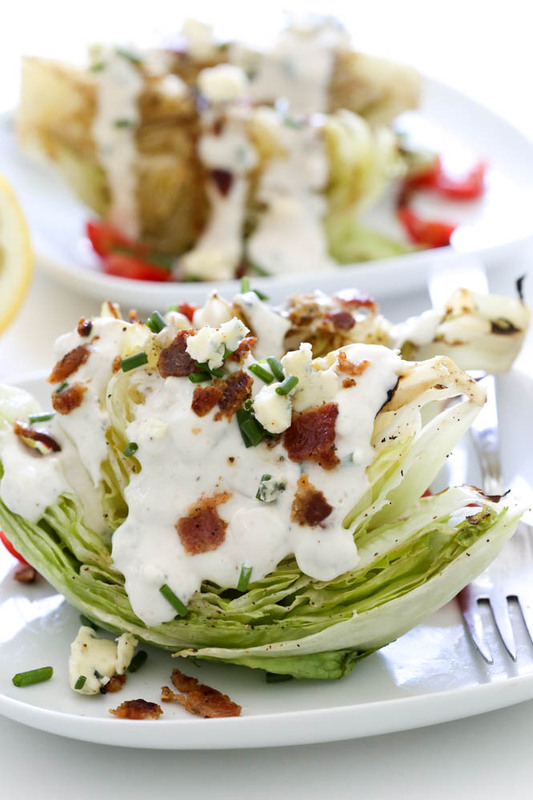 Grilled BLT Wedge Salad with Creamy Blue Cheese Dressing. 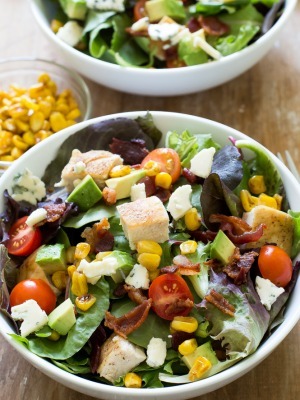 Everything you love about a BLT sandwich in salad form! Takes less than 20 minutes to throw together! BLT’s are one of my favorite sandwiches. They are so simple and classic but always taste amazing. The crisp lettuce, the crunchy bacon and the fresh tomatoes always make the perfect combination. I took it a step further and grilled the lettuce wedges to add a nice smokiness to the salad. I topped the wedges with a homemade creamy blue cheese dressing. So simple yet so amazing. These wedges are easy to whip up and make a wonderful appetizer or light dinner. You can even add some grilled chicken or steak to serve alongside. To make the wedges simply cut the head of iceberg in half and cut both halfs in half again. You should end up with four large wedges. You could also make appetizer size portions and make 8 wedges instead of 4. I added sour cream to the Blue Cheese Dressing for some tang and mayo to thicken it up. A squeeze of lemon juice adds a bit of tartness. You can easily lighten up the Blue Cheese Dressing by using Greek yogurt instead of the mayonnaise or sour cream. Even substitute skim milk for the regular milk, and go a little easy on the blue cheese crumbles. Store leftover blue cheese dressing in the fridge for up to a week and use it on salads, veggies or as a dipping sauce for chicken nuggets. This dressing is so much better than store bought! 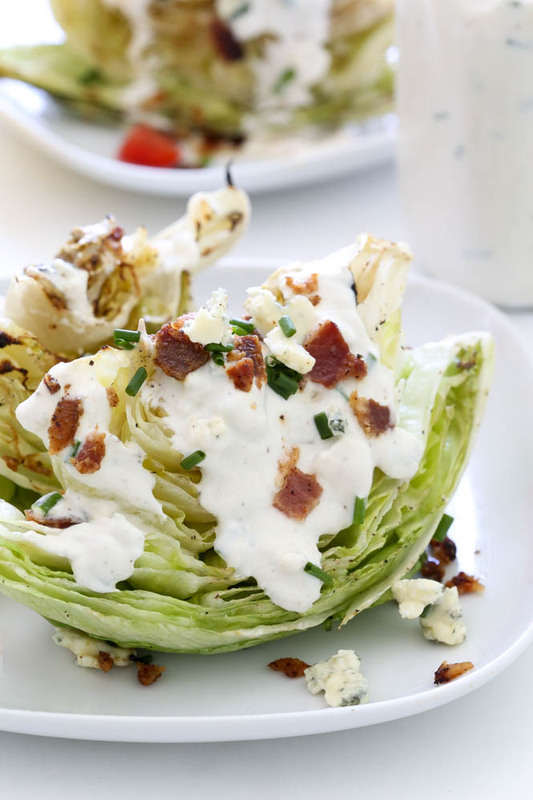 Love this Grilled BLT Wedge Salad with Blue cheese Dressing? 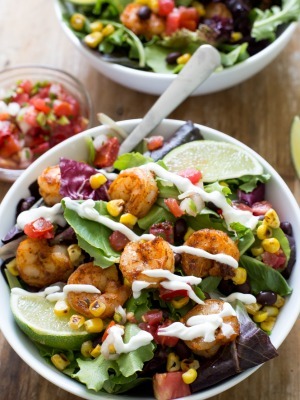 Here are some more salad recipes to try! Drizzle wedges with olive oil and sprinkle with salt and pepper. Place on the grill and cook for 1-2 minutes on each side. Take off of the grill and top with tomatoes, bacon and chives. Serve immediately with a drizzle of blue cheese dressing and extra blue cheese crumbles for garnish, if desired. In a medium bowl whisk together mayonnaise, sour cream, lemon juice, milk, garlic powder and Worcestershire sauce until combined. Stir in blue cheese and chives. Store leftovers in the fridge for up to a week. Original recipe from chefsavvy.com. Please do not publish my recipe or pictures without linking back to the original post. Thank you! 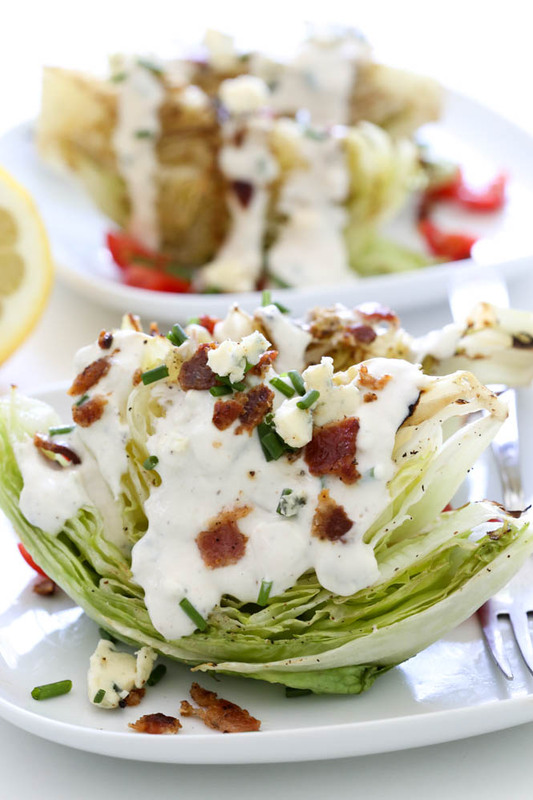 This wedge salad sounds amazing, Kelley! Anything that’s BLT flavored is a winner in my book . This sounds perfect for the summer! This is such a creative twist on a BLT, and I love that you grilled the lettuce to add some awesome smokiness! I love wedge salads and this one looks amazing! I love anything with BLT in the name! This is my kinda salad! I seriously can’t even handle how awesome these wedges look, Kelley! 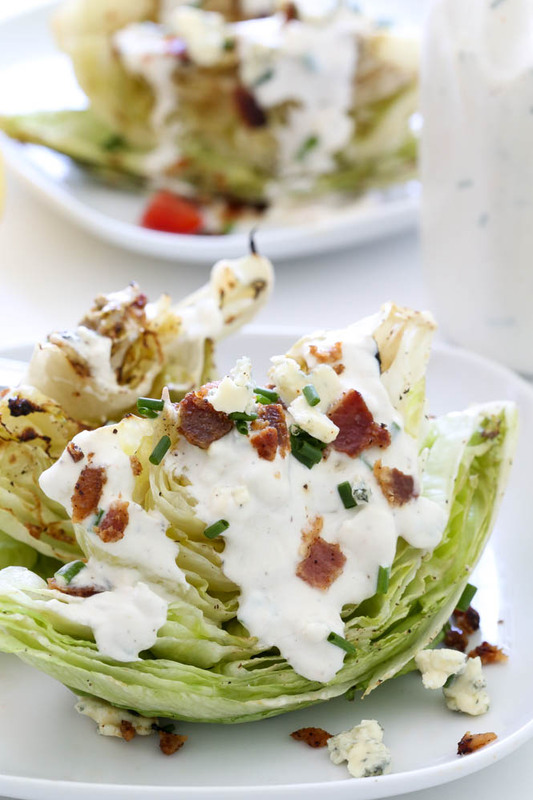 Anything BLT and covered in creamy blue cheese dressing is a total win!! I was actually only having a conversation with someone this morning about grilled salad and they didn’t think it was a thing, so I will have to send them this link. This is definitely my kind of salad, especially with that dressing. Yum! This is so perfect for a warm summer day. Grilled salads are one of those secrets that not many people have had; and they are in love once they try it. Ready in less than 20 minutes?? Count me in!! This looks amazing! I think wedge salads just look so much prettier! Love that you did a grilled version, such a great idea!